Soup's On! Fundraiser | A Savings WOW! Disclosure: Images provided by The Rotary Club of Naperville. This post has been compensated by The Rotary Club of Naperville and its advertisers. All opinions are my own. You probably know someone who is going through a difficult time financially right now. It could be due to the economy, job loss or change, health reasons, divorce, or any of a variety of reasons. It’s good to know that there are organizations that can help in your time of hardship. Loaves & Fishes Food Pantry is an organization that helps residents in the Naperville area and DuPage county with food assistance. Households outside of that area may receive a one-time emergency distribution. I took a tour of Loaves & Fishes and was able to see how they run the pantry. They have it laid out like a grocery store, so when people come in, they can have that experience, plus they offer some personal care items also, which is so helpful to many households. I know they can use any help with donations or funds to stock their pantry so they can help as many families as possible. When you attend Soup’s On!, a portion will go back to them. 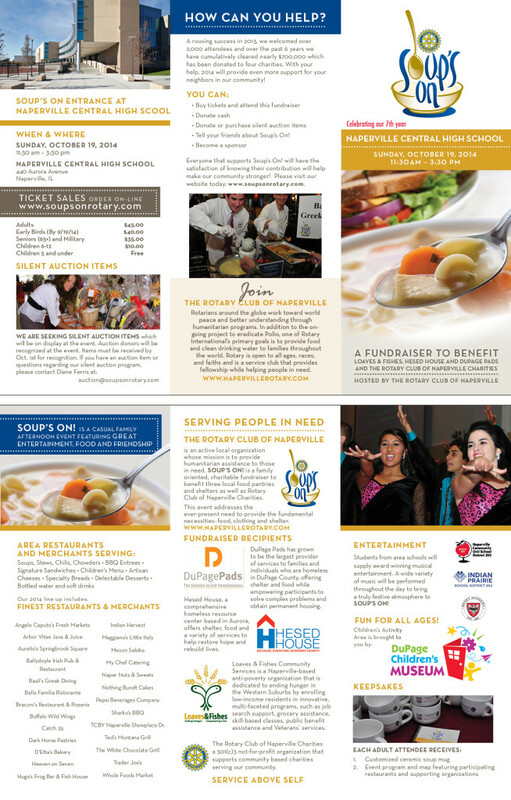 On Sunday, October 19th, the Rotary Club of Naperville will be hosting “Soup’s On!”, a fun, family focused fundraiser featuring great entertainment and plenty of delicious food. Benefitting Hesed House, DuPage PADS, Loaves & Fishes Food Pantry and the Rotary Club of Naperville Charities, the concept of “Soup’s On” ties in with the theme of a “soup kitchen” and feeding people in need – a goal of these three not-for-profit organizations. Over 30 local restaurants will be serving soups, stews, chili, chowders, and BBQ as well as artisan cheeses, specialty bread and yummy deserts. There will also be a specific children’s menu available. Guest will be treated to live entertainment by students from Districts 203 and 204. In addition, “Soup’s On!” will also have a children’s activity area sponsored by the DuPage Children’s Museum, and a silent auction. The event is from 11:30am – 3:30pm at Naperville Central High School located at 440 Aurora Avenue in Naperville. Tickets are $45 for adults, $35 for seniors 65+ and military personnel, $10 for children 6-12, and children under 5 are free. You can purchase tickets by going to Soups On Rotary and selecting “Purchase Tickets” from the left side of the home page. 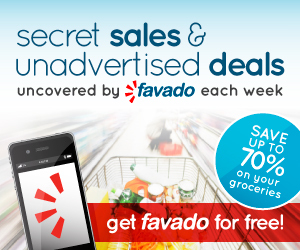 Download the free Favado app to take great money-saving deals with you on-the-go!